LIGHT GREY ART LAB: Our Cards + Our Fate! Our Cards + Our Fate! So we at Light Grey did a little experiment today to see what kind of reading would come from the combination of cards we drew! Just to see what the message of our combined cards might be. The result wasn't all that surprising! These cards together indicate a work challenge, specifically dealing with an intellectual pursuit. Though the work is overwhelming at times and and often seems inescapable, a new endeavor will be discovered from this work and it will be socially rewarding, provided the querent stays true to his or her steady and regular work pace and maintains an upbeat attitude. Pretty telling, isn't it? :) For those of you that know us, we're always working, sometimes a little too much! But it's all for a good cause and we enjoy it. Even when it's overwhelming! Between getting everything ready for Light Grey and our design work for Paper Bicycle, it's funny to see the meanings of this spread of cards! Ha! I guess our fate is sealed! Well, with that said, let's see what the cards have in store for you. Don't forget to come down and say hi to us at the opening reception this Friday! It'll be from 7 - 10pm at Light Grey with lots of food, drinks and professional Tarot readers :) Not to mention all of the great artwork! 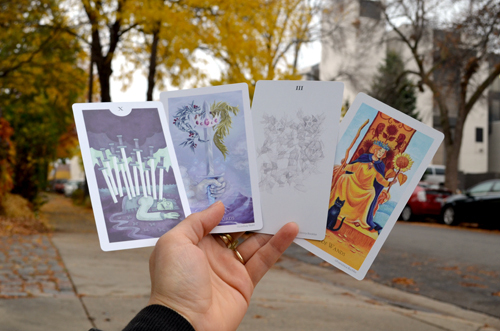 Plus, the donation based "learn to read the Light Grey Tarot" workshop the following day (Oct 27 from 1 - 2:30pm) where we'll show you how to use them! Scrabble the first thing that strike on mind is word word can increase knowledge player by connecting them as multiplayer without any payment.